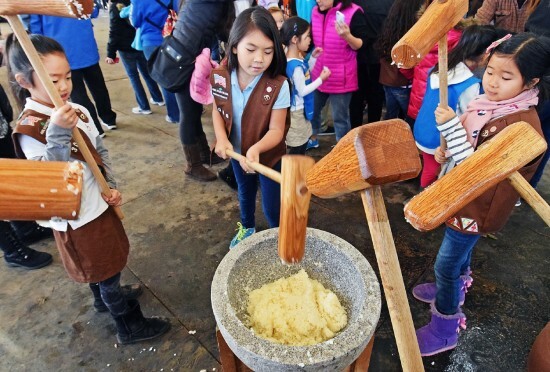 Girl Scouts from OCO Irvine Troop 3006, (from left) Audrey Shiono, Sydney Quant, and Emily Yi, find their mallet rhythm. 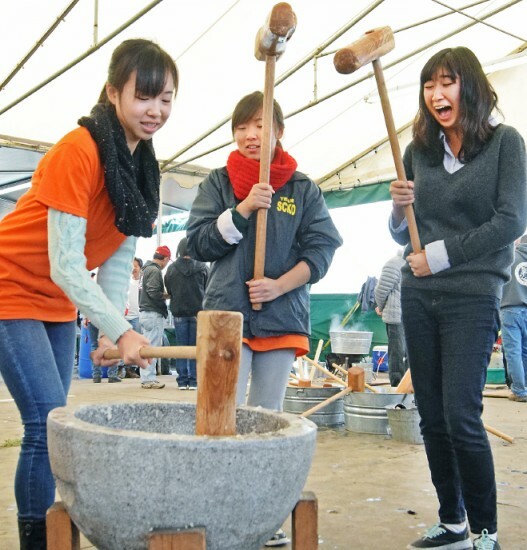 IRVINE — The Orange Coast Optimist held its annual mochitsuki at Tanaka Farms in Irvine on Dec. 27. 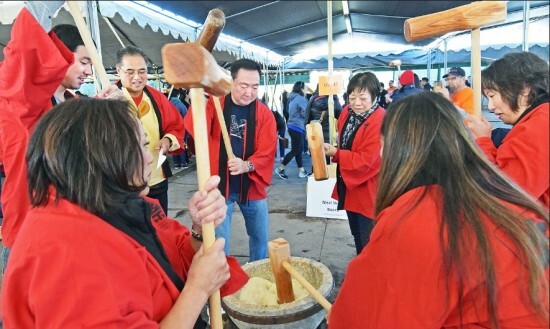 Glenn Tanaka of Tanaka Farms estimated 1,000 enthusiastic mochi-makers attended the morning activities. Suburban Optimist Club made the first-place kagami in the Adult Division with East San Gabriel Valley JACC taking second and third going to the 2015 Nisei Week Court. Winning the Junior Division was the OCBC JR. YBA team, second was captured by OCBC Sangha Teens, and the Orange Coast Optimist Cub Scouts took home third-place honors. 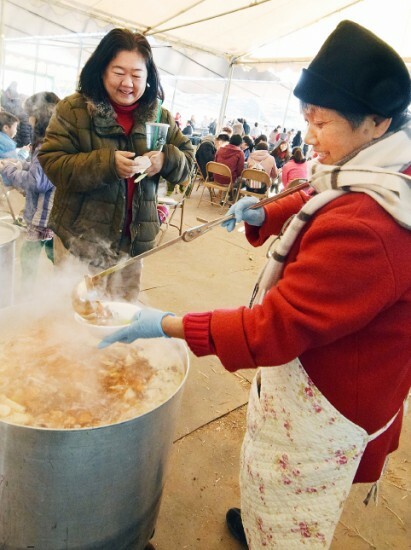 Nobuko Christoph serves ozoni for one of the estimated 1,000 attendees. 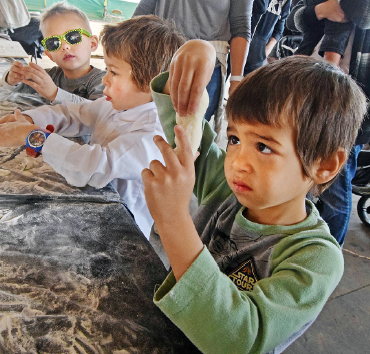 Trying their hand at art of mochi-rolling are Oliver Zaky (front), Sabastian Zaky, and Hunter Shimoda. 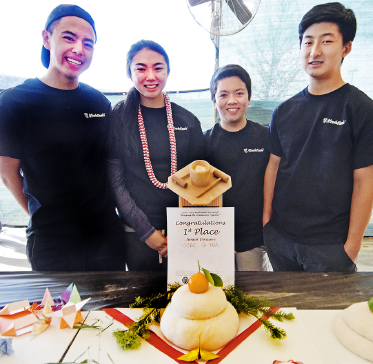 OCBC won first place Junior Division–Dyan Nishi, Kristine Yada, Jeffrey Onoma, and Gregory Terada. 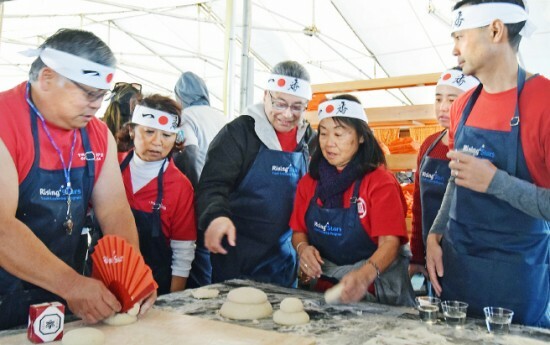 Rising Stars working on their kagami– from left, Ron Dyo, Cindy Dyo, Ray Sugimoto, Gail Matsui, Vicky Murakami, and Russ Tsuda. Nisei Week Board mochi-pounders are, from left: Cory Hayashi, David Teragawa, Patti Yamashita, Andy Shimazaki, Joyce Chinn, Michelle Suzuki and Connie Yuhara. Haruna Kubo, right, gets a kick out of Kana Okafuji’s efforts, as Jill Harasawa looks on.